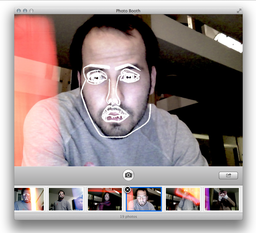 Overlays the Disclosure Effect onto your face in Photo Booth. Uses the "Face Detector" node to get the positions for eyes, nose and mouth. Made with Quartz Composer 4.6. I welcome any suggestions and feedback. And let me know if you go on to use it. The other files are included in the supplementary download.